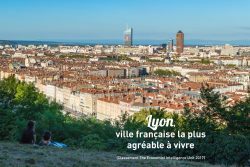 According to the annual Economist Intelligence Unit rankings (EIU), Lyon is the most pleasant French city in which to live. Among the 140 cities studied, Lyon ranks 29th in the world, ahead of Paris, which is in 32nd place. Lyon has climbed one place since last year. The EIU takes into account five criteria: stability = 25% (criminality, terrorism, military and civil threat), health = 20% (availability and quality of public and private health networks, drugs and World Bank indicators), culture and environment = 25%, education = 10% and infrastructure = 20%. Lyon seems to be benefiting from a general trend. The report points out that medium-sized cities in rich countries are those with the best quality of life. Conversely, large cities such as London, Paris, New York or Tokyo are not included in the top 10. Despite the many activities offered (economic, cultural or sporting), “business hubs are victims of their success” With frequent transport problems and high crime rates that lower their scores. For the seventh year in a row, the Australian city of Melbourne is at the top of the ranking and is the most “pleasant” city in the world. Next are Vienna in Austria and the Canadian cities of Vancouver, Calgary and Toronto. Hamburg, Germany, is the second largest European city in the top 10.